Gareloi Volcano (178.794°W and 51.790°N) is located on Gareloi Island in the Delarof Islands group of the Aleutian Islands, about 2,000 kilometers west-southwest of Anchorage and about 150 kilometers west of Adak, the westernmost community in Alaska. This small (about 8×10 kilometer) volcano has been one of the most active in the Aleutians since its discovery by the Bering expedition in the 1740s, though because of its remote location, observations have been scant and many smaller eruptions may have gone unrecorded. Eruptions of Gareloi commonly produce ash clouds and lava flows. Scars on the flanks of the volcano and debris-avalanche deposits on the adjacent seafloor indicate that the volcano has produced large landslides in the past, possibly causing tsunamis. Such events are infrequent, occurring at most every few thousand years. The primary hazard from Gareloi is airborne clouds of ash that could affect aircraft. 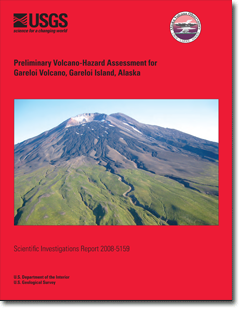 In this report, we summarize and describe the major volcanic hazards associated with Gareloi. Send questions or comments about this report to the author, M.L. Coombs, (907) 786-7403. For more information about USGS activities in Alaska, visit the USGS Alaska Science Center home page.